Since the first VFL Grand Final of 1898 (there was none in the competition's first year, 1897) there have been 120 more, 117 of them providing an outcome and three finishing in draws and necessitating replays. A team with a positive offensive rating is expected to score more points than an average team from its era when playing an average team at a neutral venue. Since the average number of points scored by teams across history has varied (see, for example, this blog) being X points better than an average opponent has implied different chances of victory in different eras. For example, a 20-point better team would be more likely to win in an era where average total scores were around 120 points per game than in an era where average totals are nearer 180 points per game. We begin by looking at the first of those eras. In the 31 Grand Finals from this era, the average victory margin was just 17.9 points and the average team score just 49 points. The largest victory was Melbourne's 119-62 win over Collingwood in 1926. That was also the only Grand Final during the era in which a team scored more than 100 points. During this period there were only four teams who went into their Grand Final with a negative offensive rating. All four lost. Two winners, but no losers, went in with a negative defensive rating. Net VPVs - the sum of the teams' individual VPVs - in this era were generally small, the average absolute value just 3.1 points per game Only for the Fitzroy v Carlton 1904 Grand Final did the net VPV rise into double digits and in 15 of the 31 contests the absolute size of the net VPV was under 2 points. For two of those three games the switch led to a correct prediction. MoSHBODS' average forecast margin for this period was 6.6 points and its average forecast team score 57.6 points per team. It selected the winner in 61% of Grand Finals with a mean absolute error (MAE) of 17.2 points in the forecasted margins. In the 31 Grand Finals from this era, which includes a drawn result in 1948, the average victory margin rose sharply to 33.0 points and the average team score rose to 83.6 points per team. The largest victories were both of 73 points, Essendon over Melbourne by 150 to 87 in 1946, and Melbourne over Collingwood by 121 to 48 in 1956. Only two teams who went into their Grand Final with a negative offensive rating. One lost and one won. Three went in with negative defensive ratings, two of which lost. Net VPVs were, on average, slightly smaller than in the preceding era and never more than 9 points. The average net absolute VPV for the era was 2.4 points per game and, in 17 of the 31 games the net absolute VPV was less than 2 points. Note that this game was played at Princes Park. For two of the four games, the switch led to a correct prediction. MoSHBODS' average forecast margin for this period was 8.2 points and its average forecast team score 83.8 points per team. It selected the winner in 63% of Grand Finals with an MAE of 29.9 points in the forecasted margins. The details of MoSHBODS' forecasts for this era appear below. In the Grand Finals from this era, which include a drawn result in 1977, the average victory margin remained steady at 32.7 points per game and the average team score rose to 94.4 points. The largest victory came in 1988 when Hawthorn defeated Melbourne 152 to 56. Negative offensive ratings were slightly more prevalent in this era, with three winners and five losers going into their Grand Finals with such ratings, including the 1981 Carlton and Collingwood teams, who both had negative ratings, and North Melbourne, who had a negative rating going into the drawn 1977 Grand Final, and into the subsequent replay. Only three teams had negative defensive ratings and they were all losers. Net VPVs, on average, rose fractionally in this period, but the average absolute value was still only 2.5 points per game. In 16 of the 31 contests, the absolute net VPV was less than 2 points. For two of those three games, the switch resulted in a correct prediction. MoSHBODS' average forecast margin for this period was 8.8 points and its average forecast team score 91.9 points per team. It selected the winner in 70% of Grand Finals with an MAE of 29.7 points in the forecasted margins. In the 29 Grand Finals from this era, which include a drawn Grand Final in 2010 and a yet-to-be-played 2017 Grand Final, the average victory margin has risen to 39.1 points and the average team score dropped marginally to 92.9 points. The largest victory in this and in any era came in 2007 when Geelong defeated Port Adelaide 163 to 44. Negative offensive ratings have been quite prevalent in this era, too, with four winners and five losers going into their Grand Finals in this situation. But, for the first time in any era, no team has gone into a Grand Final with a negative defensive rating. Net VPVs, on average, rose during this period, the average absolute value 3.9 points per game. In only 10 of the Grand Finals has the absolute net VPV been below 2 points, and in six it's been sized at over a goal. For two of those three games, the switch produced a correct prediction. MoSHBODS' average forecast margin for this period was 12.0 points and its average forecast team score 93.1 points per team. It selected the winner in 59% of Grand Finals with an MAE of 36.6 points in the forecasted margins. the 2009 St Kilda team, which had the highest defensive rating of any team entering a Grand Final (+27.7). Since they lost, they also have the highest defensive rating for a losing Grand Finalist. Lastly, let's bring all of the Grand Finalists onto some single charts, faceted by era. In this first one we'll plot the winners in green and the losers in red (and teams that drew in blue). Note that each facet has its own set of x and y axes reflecting the spread of ratings across the era. 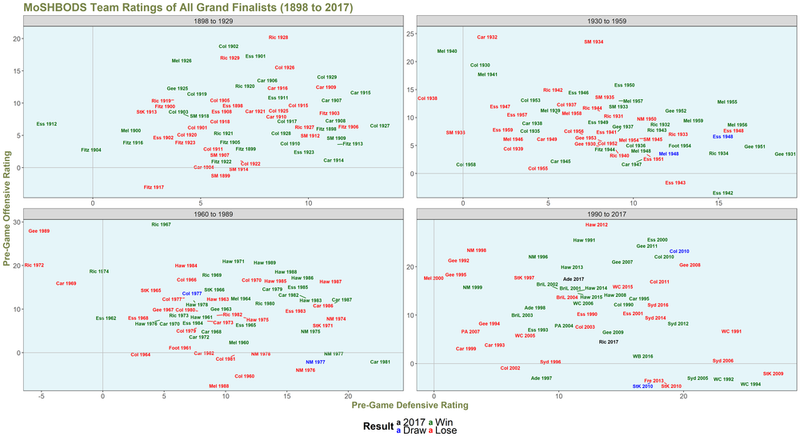 One aspect that this chart makes especially clear is the increased preponderance of Grand Finalists with negative offensive ratings in the most recent two eras, and their relative success in the most recent era. For the final chart we'll plot each Grand Final (excluding the drawn ones) based on the rating differences for the winning versus the losing team, colour-coding the labels to reflect the size of the final margin of victory. Perhaps the most notable feature of this chart is the greater tendency in the most-recent era for relatively large victories to be recorded by teams that were superior offensively and inferior or only very slightly superior defensively.